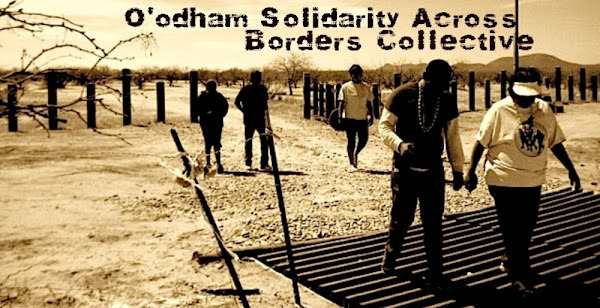 O'odham Solidarity Across Borders Collective: Mexico: Human Rights Defender? Since when? "We are not doing this to hassle Americans or bother them. It is to have better order, be more organized and provide better services". OSABC would like to identify the contradiction in the Mexican Government's need for "paperwork" (U.S. Passport) within "its" boundaries, and its oppositional position in Arizona law SB 1070, which also requires "paperwork" within the state of Arizona. Both policies are a tightened regulation of the free movement of people. Mexico's new restriction are a direct attack on movement for all, but especially for the indigenous on both sides of the border line. For our people, the O'odham, this is a great concern. The article we've reproduced below is from the tribal newspaper, which covers the concerns that our people have with this law in Mexico. Many are concern how this will affect us this coming October as we make our yearly pilgrimage to Malina (also knows as Magdalena), and overall travel into Mexico. Malina is located in the Sonoran state, and is roughly 65 miles south of Nogales, clearly passed their 12 mile checkpoint known as "Marker 21". Mexico's new requirement for a U.S. passports affects all O'odham, but especially our elders due to the requirement of a birth certificate. Many of our elders were born outside of the system and do not have records of their birth. Or, as was told to me by my grandpa, were lost in the 1940's when a tribal government storage building containing records, burned down. My grandpa was one of many who lost his "paperwork", and to this day, struggles with the State's ever growing demand for it. Meanwhile, Mexico's public denouncement of SB 1070 sounds good on paper, but at the same time we can't help but see the contradiction in its position. The Mexican government and the state of Sonoran Goverment officials denounce SB 1070 on grounds of racial profiling, safety and overall humiliation towards its citizens. Do they expect a standing ovation, a round of applause? Hmmm? While at the same time, the human right violations that they denounce, the Mexican State carries out towards the indigenous of Mexico everyday. Ask the Zapatistas and other autonomous indigenous communities that are resisting the Mexican State oppression. The recent news of the Mexican paramilitary attack in Oaxaca is just another example of that. For our people, we are now restricted in a 12 mile "cage" between the international line and the 12 mile area "granted" to us by the Mexican State. Our tribal ID's are still "respected" (even though are highly questioned when re-entering the U.S.), but with Mexico's new regulation of movement, we are left wondering how long that will continue. The U.S. could further violate our right to free movement by dismissing our tribal IDs due to Mexico's new regulations. OSABC is left to wonder if this is the first steps towards that. The U.S. could have the attitude that since Mexico is requiring everybody to have U.S. passports to travel more than 12miles, then ALL must have a U.S. passport to re-enter the the U.S. Regardless of what the State views as "proper" paperwork in international travel, these policies by both the U.S. and Mexican State undermine and attack indigenous autonomy/sovereignty. SB 1070, U.S. Border Patrol on T.O. Nation (overall presence and check points), and internal Mexican check points are all the same, a control on movement. In our case, also a attack on religious freedom due to the requirement just to embark on our pilgrimage to Malina. These requirements now put our elders in an position where they must plead with the state by applying for passports, but without birth certificates, this makes this process a huge task, to say the least. OSABC feels we should not submit to these requirements. We as O'odham should have the right to free movement. This is still our jewed. OSABC would like to highlight this contradiction so it will hopefully lead to a better understanding of the U.S./Mexican State attack on free movement. Deeper economic policies are into play, that lead to such regulation. If capital can move freely across borders (NAFTA), why can't people? The last contradiction out of the Mexican State's new regulation is that it will not apply to travel towards Rocky Point. So, free movement for American tourists, but not for indigenous people. We hope this article below gives some perspective in our struggles to maintain our free movement for cultural autonomy. SELLS- If you're planning to make the pilgrimage to Magdalena, Sonora next October, you will need an American passport, and since it can take up to a couple of months to get one, you might want to get started now. The Tohono O'odham Nation's Executive Office issued a travel alert in early March, informing tribal members that Mexican law now requires U.S. citizens traveling south of kilometer marker 21 to have a passport. A handful of inquires about that requirement reveals that some Tohono O'odham are still unclear about the change in Mexican law. Brenda Cruz, Executive Assistant to Tohono O'odham Nation Chairman Ned Norris Jr., said the travel alert is very clear, and the change in Mexican law in no way affects the use of tribal ID cards issued by the Tohono O'odham Nation. She said official tribal ID cards issued by the Nation are accepted by the U.S. Department of Homeland Security and the Border Patrol when O'odham traveling in Mexico are returning to the United States. The need for a passport is something required by the Mexican government for U.S. citizens when traveling in Mexico. Why the Mexican government passed the law is unknown to her, Cruz said. Nonetheless, she said, Magdalena, Sonora, the destination of an annual pilgrimage made by hundreds, even thousands of Tohono O'odham every October, is well below the kilometer 21 marker in Sonora. Because of this, those making the pilgrimage next October will need a U.S. passport, she said. To get one, a person must fill out and file an application for a passport, and one of the required documents to show evidence of U.S. citizenship is a birth certificate. While this is not a problem for young and middle-aged Tohono O'odham, it could affect elders, many of whom were born at home and never got a birth certificate, Cruz said. If this is the case, other secondary evidence such as baptismal and early hospital records can be used, and in some cases even testimony by someone who witnessed the birth, she said. But if a person is an elder, it is unlikely someone who could offer such testimony is alive. Cruz said there may be no relief for elders in this predicament, and some may not be able to make the pilgrimage to Magdalena. For those Tohono O'odham who will be applying for a U.S. passport, they will need their birth certificate and Social Security card. The cost for a regular passport is $100, and the cost for a smaller, wallet-sized passport is $45. The passport card can be used only for travel to Mexico and Canada. For other international travel a regular passport is required. Cruz said she gets from one to two inquires a day about passports, and she cautioned that since it can take up to two months to process and received a passport, it would be wise to get started now. For more information about getting a passport, contact Cruz.